I have seen a tin penny whistle with a US stamp and an eagle imprinted on it. Can anyone give me any history on that? I Would really like to find one and purchase it. Help! Please advise. I've looked all over and I can't find anything as you describe. Where did you see it? There was one listed on eBay, but it has been sold and is no longer available. I am a small civil war collector and was curious about the markings. I am hoping someone has come across something similar that they can share some information regarding this whistle. I know the soldiers carried such tin whistles with them during the war, to entertain themselves and campmates during down time. Any information regarding this topic would be appreciated. I don't recall seeing any whistle marked as stated. Possibly a custom made instrument. There are souvenir type instruments from Colonial Williamsburg and civil war era fifes memorabilia. There was one listed on eBay, but it has been sold and is no longer available. Because you said "tin", I assume the metal was either indeed tin or some other whitish metal. Is that correct? I couldn't even find the eBay listing. Nice old metal flute that has some rust (mostly superficial), estate found, measures 14" long. The flute is keyed in "B" (it looks like an R but it's a B). We are assuming that this is Civil War era due to the style of the eagle it may be into the indian war period, we never seen one that is metal they are normally rosewood. They way this flute is stamped out of sheet metal we don't think the cheater pieces that you see on the wood ones would have worked on this flute. Pretty clear the seller didn't know much about the instrument, but the rust and look of the metal is similar to the "tinned" pie plates and other cooking materials from early 20th century. Couldn't guess as to the origin of the whistle, however. Even if it's not of actual tin per se, it's totally what we'd call a tin or penny whistle. ... we never seen one that is metal they are normally rosewood. At this point I think you must be talking about fifes. I dont believe this is a fife, because a fife is held differently and i dont believe they were ever made out of metal. It's a whistle or a flute, but very interesting. It was your comment, "normally rosewood", that threw me. Especially since they became mass produced, in the Western tradition metal whistles (and now plastic as well) have predominated. Wooden whistles of any kind are not the norm, but are specialty and even luxury items. I don't think I've ever seen a wooden whistle from the same time period as your metal one; fifes, OTOH, are a different matter. A quick overview of terminology and its use on this website: All whistles, ocarinas, and endblown or sideblown flutes are technically "flutes", but here a flute refers to those instruments without a fipple (sideblown flute, fife, shakuhachi, etc.). In reference to whistles (which have fipples, like your instrument in question), here it's best to simply call them whistles unless you're being scholarly, and we seldom have need to bother with that. It is very similar. Amazing you found that similarity. If you ever see a whistle with that image, dont hesitate to contact me. Thank you all for your interest. Yes that is a tin whistle or penny whistle. Sometimes called a "flageolet"
The marking does look civil war vintage to me and I'm a US historian for a living. But it was common to cater to Civil War era "nostalgia" very quickly and for a while--Thomas Nast would often have Santa Clause delivering toys with Civl War era US marking on them. Very interesting! 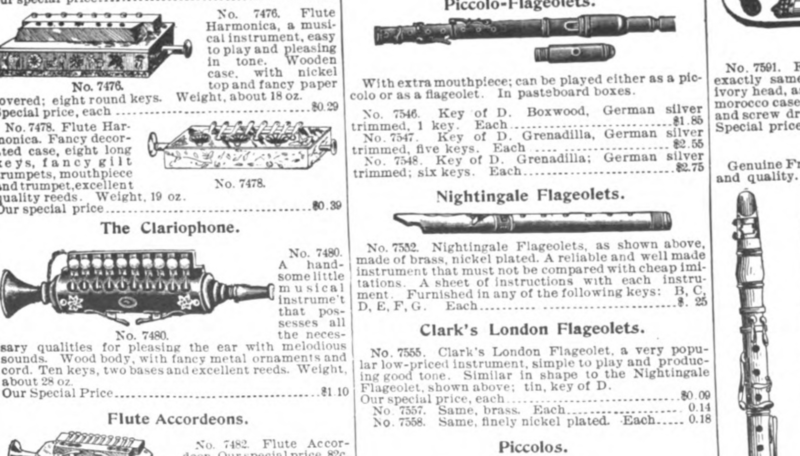 It may have a lead plug at the mouthpiece--old tin whistles often did.